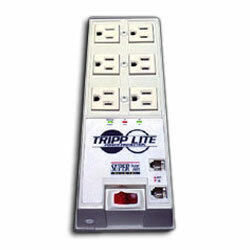 Tripp Lite's 6 AC Outlet Surge, Spike and Line Noise Suppressor with Modem/Fax Protection FM Surge Suppressor has 6 outlets and built-in RJ11 jacks prevent surges from damaging your modem/fax/phone equipment.The unit has 2,100 joules of surge energy absorption to handle the strongest surges. Diagnostic LEDs alert the user to potential power problems. The Super-Surge-Alert+Tel comes with child safety covers and color-coded cord identifiers.